Les Sables du Midi is a Siblu Holiday Village that is perfect for those looking for a campsite near to a stunning beach with lots of thing to see and do nearby. This large fun filled family friendly campsite is the perfect place for a family camping holiday to France with a large range of on site activities available. Located between Serignan and Valras-Plage on the outskirts of Valras-Plage, Les Sables du Midi occupies the perfect location just 1km from a soft sandy beach yet being away from the main hustle and bustle of the popular seaside resort. The beach can be reached in around 15 minutes by foot or quicker by bicycle offering visitors the chance to find out why this particular part of France is so popular. Long soft sand stretches out for miles and the safe pleasant warm waters are perfect for families of all ages. Whether you just fancy sitting on the beach to do a spot of sunbathing or your children want to build sandcastles or swim, you’re sure to have a fantastic family day out at the beach. Les Sables du Miidi’s main attraction as with many French campsites is its swimming pool complex. Two heated swimming pools and an aqua splash zone, which features fountains, water jets, buckets and flowers that spray water onto the kids, along with several water slides ensure that everyone has a great deal of fun and the surrounding sun bed area allows you to sit back and relax whilst they enjoy themselves. Les Sables du Midi campsite offers a comprehensive range of activities and facilities both nearby and also on site. 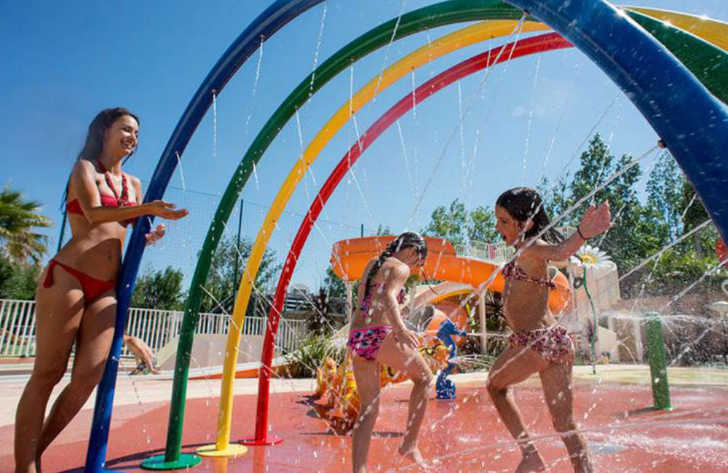 On site activities at Les Sables du Midi campsite include multi sports area, football, basketball, volleyball, gym, table tennis, boules, wellness area, cycle hire and a playground. Facilities available at Les Sables du Midi campsite include WIFI, restaurant, snack bar, takeaway, bar, groceries, animation team, games room, tv room, washers and dryers. Accommodation at Les Sables du Midi campsite includes a range of 2 and 3 bedroom mobile homes that are available from Siblu and Suncamp.